14.1 - Moving Facilities, Updates and GSoC Projects. 14.2 - SDI, IMU, Power Board and Enclosure Progress. As you may have noticed there are ongoing efforts being made to improve and revise the website's design. The first article we released with the new layout was a work report by one of this year's GSoC students. We're in the process of fine-tuning the general theme and also making sure it works well on mobile (please give it a try) so expect to see more content being moved over to the new design in the near future. Let us know what you think in the comments or if you have ideas or suggestions for improvements by contacting us. Pretty much any plastic part in your kitchen, car, phone, laptop, etc... is mass-produced via injection moulding. The process quickly explained: raw plastic is heated up until it liquefies, then it's pushed into a mould shape - traditionally a metal "negative" cast form called 'tool', and after cooling down and solidifying the plastic is taken out of the mould form. This method generally only makes economic sense when producing a large number of parts because the tool is expensive to produce. For manufacturers producing millions of parts with the help of a tool the per-part-cost drops to in the region of a few cents per piece. But for smaller teams that require smaller quantities (like us) injection moulding has, for a long time, been off the table. But times are changing! In a first run a high-temperature, resin SLA, 3D-printed mould was used. In the second run an aluminium, CNC-milled mould produced our first injection moulded parts. The purpose of this exercise has been to build a special heat-conducting, graphite-compound-plastic heat-sink for the AXIOM Beta's MicroZed. Thereby improving on heat dissipation inside the camera's enclosure. Traditional plastics like ABS behave like honey when they becomes liquefied whereas this graphite compound felt more like oatmeal - lots of pressure, preheating and air escape-holes were required to get it into the cast form. With this first attempt being a great success we can think of more opportunities to injection mould in the future, e.g. 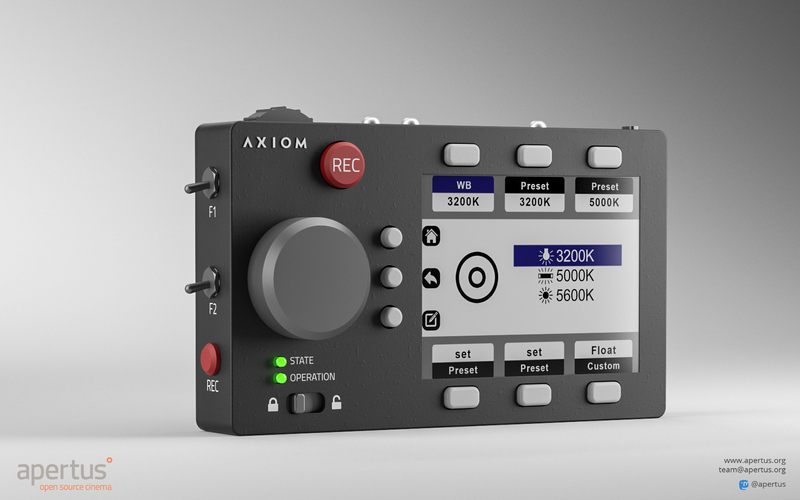 dials or knobs for the AXIOM Remote possibly? Work on the AXIOM Remote is continuing with a first, working prototype being used to complete software development. We're presently using an Adafruit 2.8" TFT with 320x240 pixel resolution, a PIC32 central processor and there are two smaller PICs to handle button switch and rotary encoder events. AXIOM Remote PCB populated bottom side (LCD not attached yet). AXIOM Remote PCB populated top side (LCD not attached yet). Next step is refining the menu structure/behaviour and general usability. A 3D printed enclosure prototype is also planned before we make first, metal enclosure prototypes. Further reading on the Wiki. AXIOM Remote menu navigation development (work in progress - fun levels are already increasing :P ). We were concerned about the project's social media presence beforehand, but with the recent data leak scandals, reports of stolen or sold user data etc, we're definitely conscious of how using 'services' means that we effectively promote a company's business model (where the user is the product being sold)... It's important that the community is kept informed of how projects develop so just deleting our facebook profile could impact negatively on some people. What might the alternatives be? There are growing numbers of more privacy aware and decentralised platforms such as Mastodon ... which seems to be the best micro-blogging alternative to Twitter out there, or PeerTube... which is a peer-to-peer YouTube alternative. Some alternative platforms out there still don't have the critical mass required to be widely adopted, but this can be a positive in that demographics often tend to be well concentrated on smaller social sites. Nevertheless it's important that we're seen to be early adopters and supporters of platforms that respect their users e.g. Mastodon. Got any recommendations for open source applications you couldn't live without? Let us know in the comments. Back in 2017 we shot footage on the AXIOM Beta for the Vienna Biennale in the Museum of Applied Arts Vienna. Close up views of the process of aluminium smelting in the context of recycling/reusing raw materials were gathered for the project. It was recently agreed that what was hitherto exclusively screened at the museum may now be released to the public. I suggest to delete personal Facebook Accounts and only use it as organization to inform users still there. Maybe explain in the profile that the platform is not in line with your philosophy. Maybe a link with an article about the problems. In addition to PeerTube i also know d.tube exists. MediaGoblin also want's to integrate federation, but sadly it takes forever. This update shows great progress. I like to finally see the metal video. Did I see a flash of "black sun" during the pour of the liquid metal? Other cameras have had this effect where over exposure causes the clipped parts of the image to turn black. This only flashes briefly, but will definitely have to be dealt with. Yes I believe so as well, its the center area of the brightly glowing liquid metal. The CMV12000 already has black sun compensation parameters but its a trade-off between that compensation and noise so we will make sure its a parameter that can be dynamically adjusted in case black sun artifacts occur.